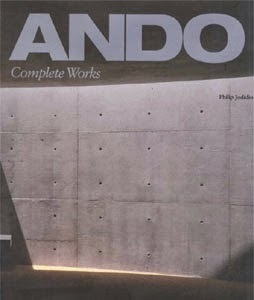 If there's an architect worthy of a gargantuan coffee table book, slightly smaller than the Phaidon Atlas, it's Tadao Ando. One of the most consistent architects in terms of quality of output as well as in his use of materials and geometry, the large-format photographs and drawings here are a suitable expression of his buildings, outside of the possibility of seeing them in person. Ando is known for his reliance on concrete, a heavy and thick material that he is able to manipulate in unfathomable ways. As a bearer of light, the concrete surfaces don't so much call attention to themselves as the space they contain, an indication of his skill. These qualities come through beautifully in the roughly forty projects presented, beginning with a 1970's row house and finishing with another single-family house completed less than five years ago. In between are some of his best projects (Church of the Light, Water Temple), some of his biggest (Chikatsu-Asuka Museum, Awaji-Yumebutai), and some preliminary designs (Calder Museum, Ground Zero Proposal) that will never see realization. Jodidio's concise text is an appropriate companion to the photos, clearly describing each design alongside the photographs and drawings.